« Tribute from America for our NATIONAL PARK – the first ‘NATIONAL’ ever! The holding of the Sixth World Parks Congress in Sydney from 12-19 November presented First National Park with a once in a life time opportunity to put the case for World Heritage listing of the Royal Reserves to a huge international conservation audience. Of the total 5,600 delegates 3,400 were from overseas and from 168 countries in the World. 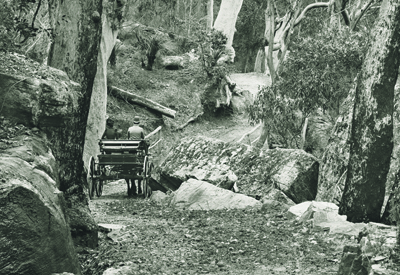 The particular significance of the World Heritage quest of the Royal reserves to the Congress was that Royal National Park (formerly ‘National Park’) was the very first place in the world to be reserved for the new land protection purpose of ‘national park’. It establishment in 1879 was in no way connected with or inspired by the reservation of Yellowstone Public Park in 1872 where the name of ‘National Park’ was given to it to make it clear to all that it was under federal jurisdiction. Our aim at the Congress was to interest the delegates, including those from Australia, in learning more about the history of the area and its natural attributes and, of course about its significance to what is arguably the most important conservation innovation in human history – the world-wide national parks movement. We used three main ways of attracting the interest of the delegates and providing them with information. First, our stall at Audley was visited by many of the 90 delegates who took part in a Royal National Park excursion on Sunday 16 November. On that same day we also had a stall at Olympic Park at an event called Planetfest. Tools for the spreading of our information including several pamphlets, our book The First National Park A Natural for World Heritage, and specially prepared T.shirts emblazoned with ‘Naturals for World Heritage Royal National Park Heathcote National Park and Garawarra State Conservation Area’. If you have read this post and you or a friend would like more information please contact us on 9528 0444 or by email.